The basic form of the SELECT statement is SELECT-FROM-WHERE block. In a SELECT statement, WHERE clause is optional. 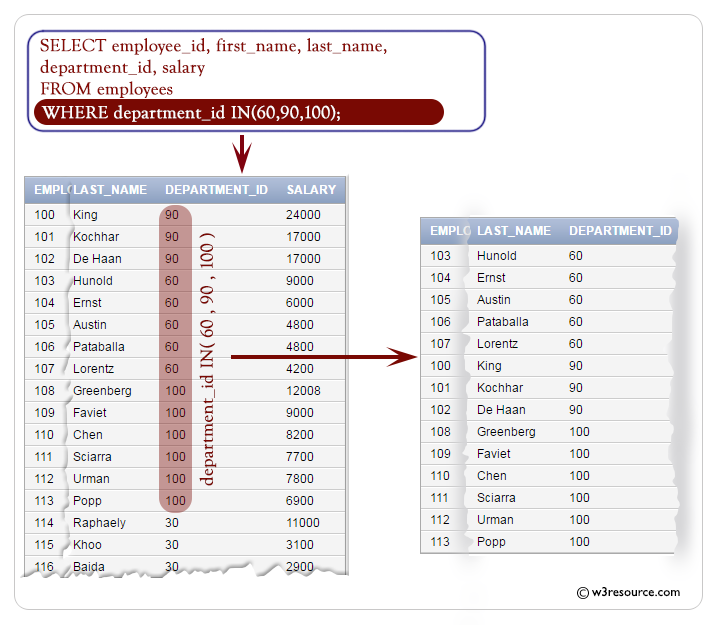 Using SELECT without a WHERE clause is useful for browsing data from tables. In a WHERE clause, you can specify a search condition (logical expression) that has one or more conditions. 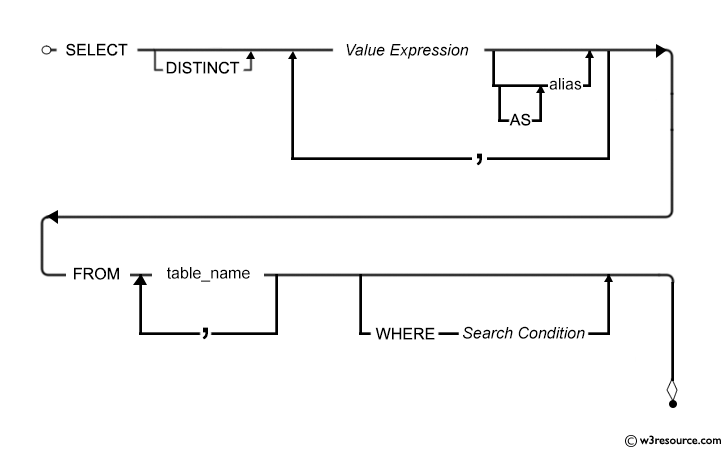 When the condition (logical expression) evaluates to true the WHERE clause filter unwanted rows from the result. 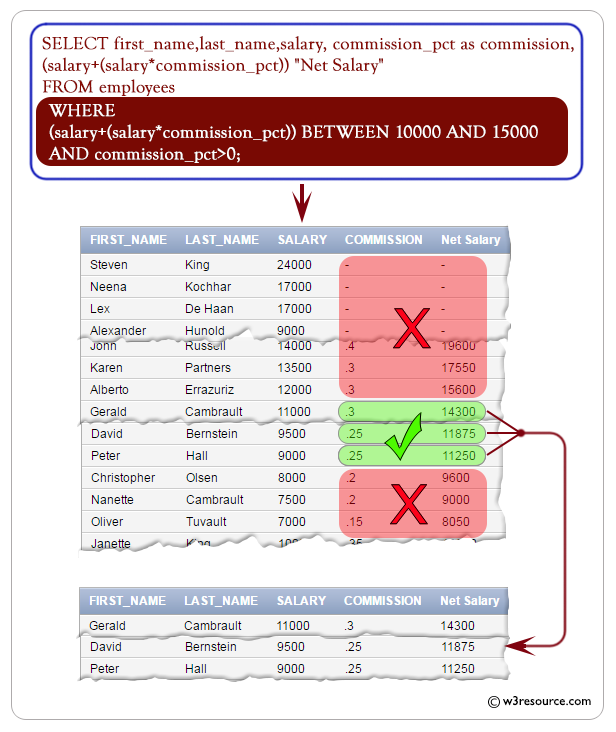 column_list Name of the columns of the table. 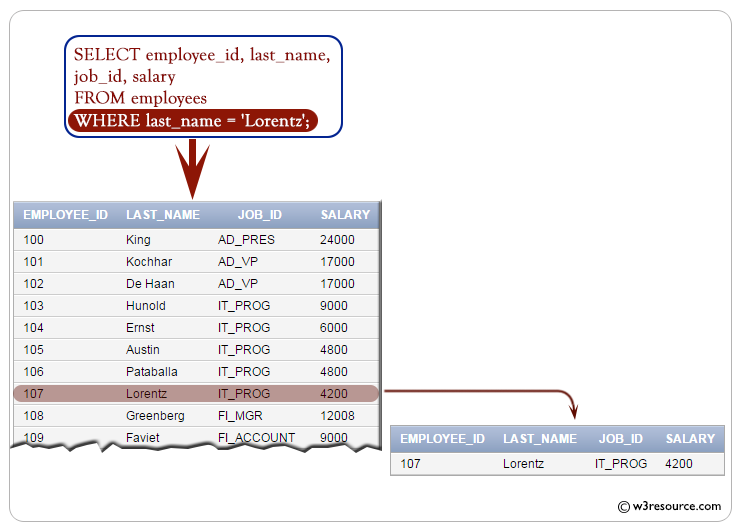 The following query displays the employee_id, job_id, salary of employees whose last_name='Lorentz'. Note : Character strings are enclosed in quotation marks. 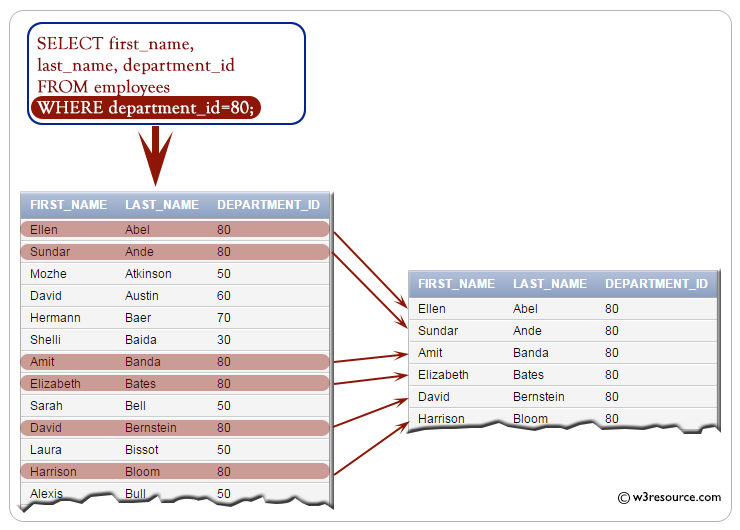 Character values are case-sensitive for some database. The following query displays the first_name, last_name , salary and (salary+(salary*commission_pct)) as Net Salary of employees whose Net Salary is in the range 10000 and 15000 and who gets atleast a percentage of commission_pct. The BETWEEN condition is used to test for values in a list. 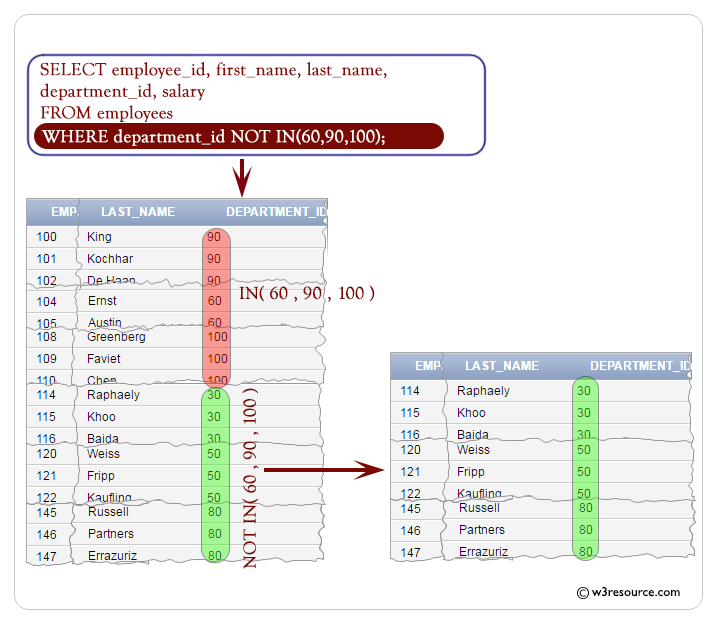 The following query displays the employee_id, first_name, last_name and salary of employees whose salary is greater than or equal to 4000 and less than equal to 6000 where 4000 is thelower limit and 6000 is the upper limit of the salary. The IN condition is used to test for values in a list. The following query displays the employee_id, first_name, last_name, department_id and salary of employees whose department_id 60, 90 or 100. The LIKE condition is used to perform wildcard searches of string values. The search condition can contain either numbers or literal characters, _ denotes one character and % denotes zero or many characters. 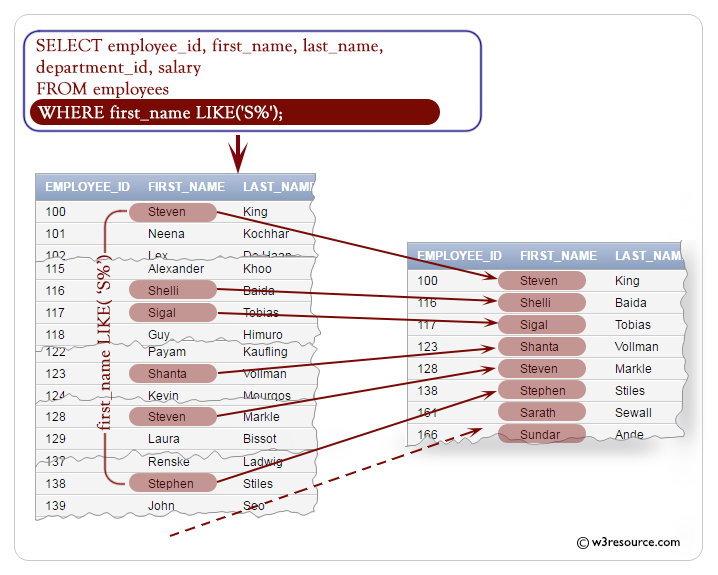 The following query displays the employee_id, first_name, last_name and salary of employees whose first_name starting with 'S'. IS NULL operator is used to test for nulls. 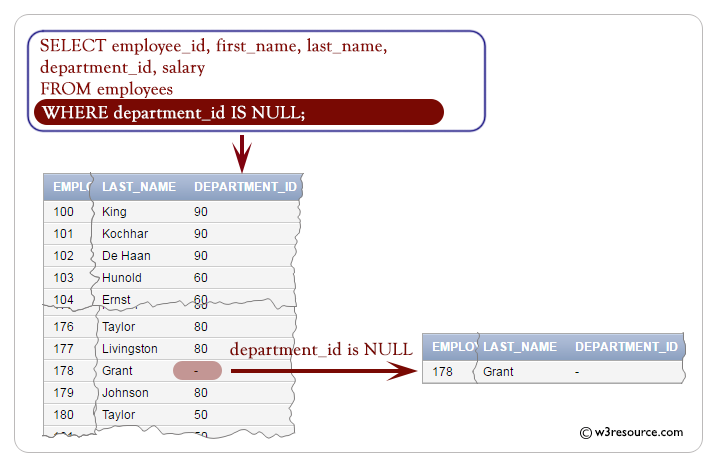 The following query displays the employee_id, first_name, last_name and salary of employees whose department_id is null. AND Returns TRUE if both conditions are true. OR Returns TRUE if either condition is true. NOT Returns TRUE if the following condition is false. 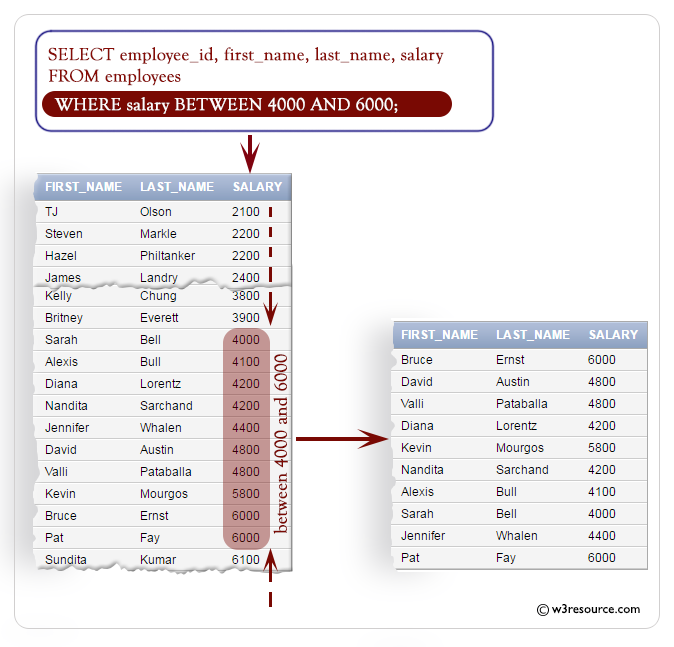 The following query displays the employee_id, first_name, last_name and salary of employees whose first_name starting with 'S' and salary greater than or equal to 4000. The following query displays the employee_id, first_name, last_name and salary of employees whose first_name starting with 'S' or 'A'.